Ivo of Chartres (1040-1116) taught at the renowned cathedral school of Chartres, where he was known as one of the best teachers in Europe. Among his influential writings, his collections of ancient canons or canon laws represented advances in organising laws and providing new rules for solving old legal problems in a time when law was not clearly defined as an area separate from theology. This manuscript is a copy of his most widely distributed legal collection, called the 'Pannormia', which belonged to Newburgh Priory. The first page of the 'Pannormia' has an inscription at the top identifying it as a book belonging to St Mary of Newburgh, which would have been a relatively new priory at the time, having been founded in 1145. The much later stamp in the lower margin identifies its 17th-century owner Henry Howard, Duke of Norfolk and Earl of Arundel, who gave the manuscript to the Royal Society. 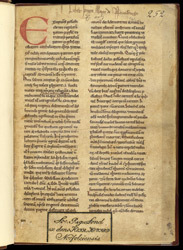 Today it is in the Arundel Collection in the British Library.